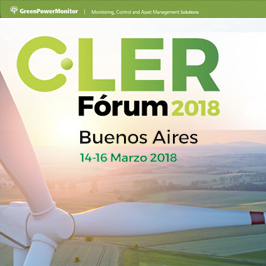 GreenPowerMonitor joins DNV GL at CLER Fórum 2018. The event will take place next week in Buenos Aires, Argentina, starting on March 14th. Our Country Manager Chile, Carolina Salas will join the event and will be ready to show you how GPM monitoring solutions can help your next renewable energy projects become a sucess. Don’t miss the chance to meet her in Buenos Aires!